Welcome back to our ongoing POV-FS on the road series. It’s been a while since England and a planned excursion down to Florida for the Disney tournament did not come to fruition, so I jumped at the opportunity to spend a few hours on the bus to attend a momentous occasion for Canadian soccer. 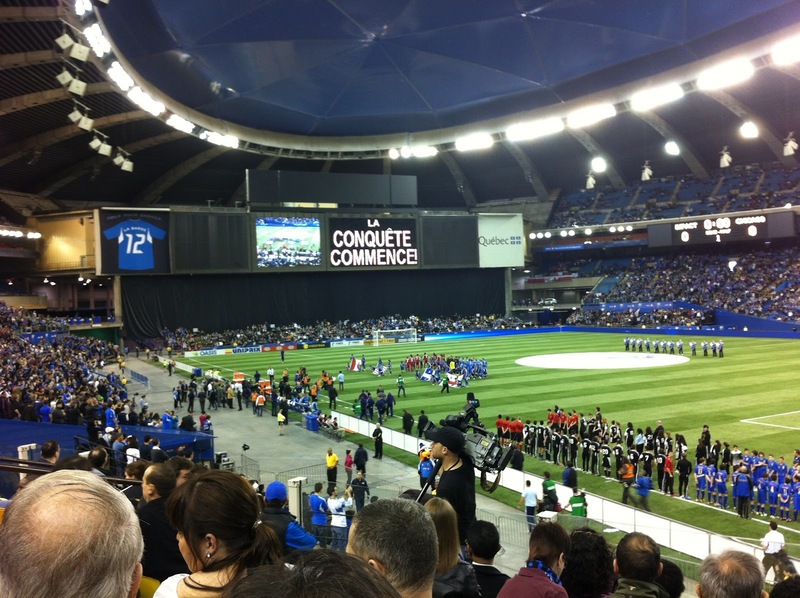 Having had to give Vancouver’s opener last season a pass – I desperately wanted to go see Empire Field and the Whitecaps new beginning, but couldn’t swing the travel costs – I was not about to waste this less-extravagant chance to be part of something historic. 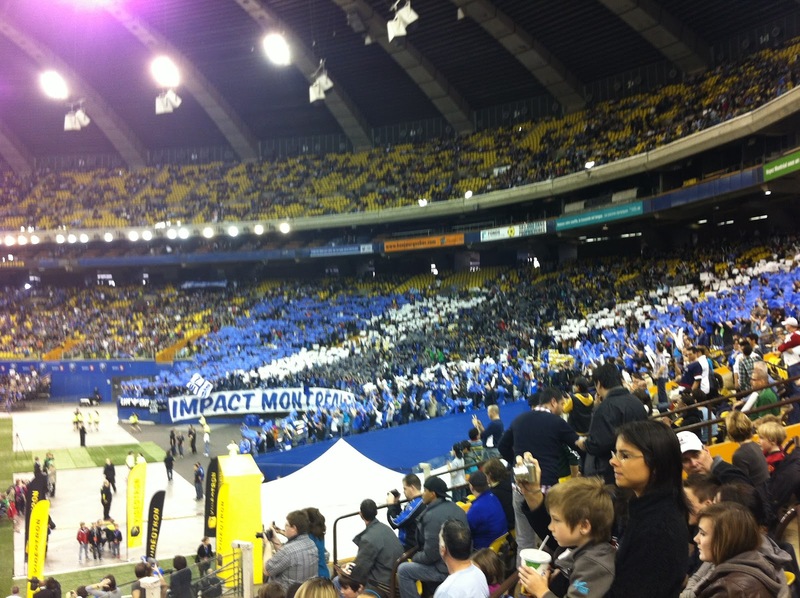 I ordered a single ticket for myself a few weeks back; the Impact staff was very helpful. Also grabbed a pair for Toronto FC’s visit on April 7th, hence the designation “Scouting Trip” above. Up and out of the house early - a bit of coffee in the system - making it to the venerable old bus terminal downtown for 6 a.m. Boarding was smooth and soon enough we were on our way. The ride was pleasant enough; the day was overcast, the Sun, a ghostly white disk hidden behind the clouds, occasionally peaking out with blinding fury, before retreating again, thankfully, I had chosen the wrong side of the bus for my blinded eyes. The scenery once one clears the GTA can be quite enjoyable; the occasional crusts of the Canadian Shield around Kingston are a useful distraction. I particularly liked the sections of the journey when we were closest to the water, being early spring the waterways were a torrent, the lowlands flooded with the runoff from the winter melts. 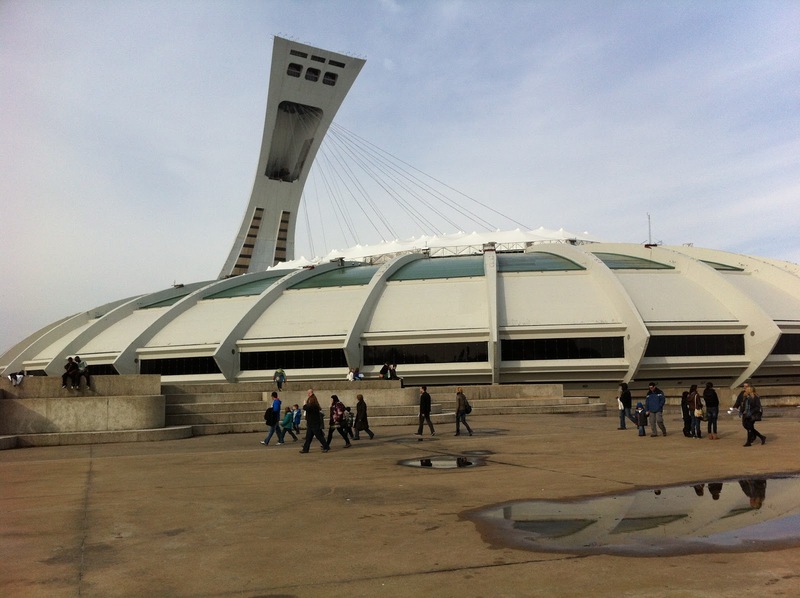 But enough of this meandering, upon arriving in Montreal, I hopped in a cab and headed straight for Stade Olympique, a rather long ride, during which my Haitian cab driver did not appreciate my nervous grade school French, and there I was. A bit premature to be speaking of conquest, non? After finding my bearings and the Will-Call station – it’s tucked in a huge basement near the middle of the stadium – I attempted to find my seats in the cavernous ground. This is where my lack of attention at school really proved a problem; luckily I had left myself plenty of time to wander and point, asking every stadium employee to prod me in the proper direction. Twenty-five minutes or so on, finding what I assumed to be my seat, I took in the surroundings and plugged into Twitter to see lineups and catch up. Despite a half-hour remaining until kickoff, it was safe to estimate the house was about half full, the supporters section to my right was already full in stature and in voice, as the rest of the city made its way in. I tried not to stare, but glancing over the crowds, I was struck by its diversity. Families, both young and older, men and women, twenty-something’s with a few friends or their significant other, what I took for three generations of one tribe directly in front of me, and the occasional lone wolf like myself, a bit removed from those twenty-something’s, but intense enough. The St. Patrick’s Day Green dotted in bunches was soon overpowered by what I am informed is called Satellite Blue. Sadly there were vuvuzuela’s and thunder sticks aplenty in attendance – sold and handed-out around the circumference of the stadium – but let’s forgive them this trespass, and that of the so-called Mexican Wave that came later. The food actually looked and smelled good, perhaps I was just particularly hungry after my long journey, but smoked meat, French fries, hot dogs – all staples of the Montreal I know – and pizza were readily available. The pizza is worth mentioning, solely for the fact that it appeared surprisingly appetizing; with proper sauce and what a cursory inspection revealed to be actual cheese. With the Saputo name plastered around the facades, it is only fitting that the melted covering of a healthy slice be of the utmost quality. As the time approached, the seats began to steadily fill. 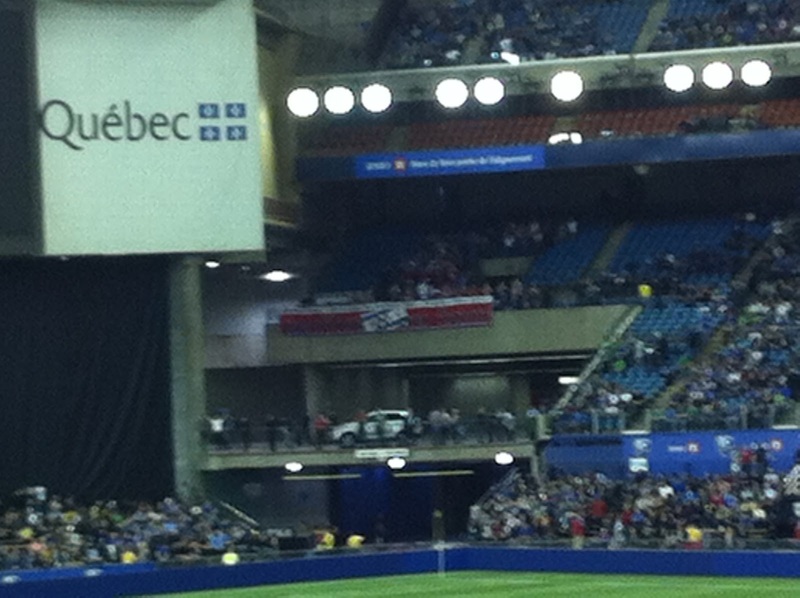 It is a cavernous place, but loud; there is no room for modesty at a French Canadian sporting event. My stoic attitude throughout the match – I couldn’t bring myself to cheer for the old foe; allowing only the most respectful of slow claps at the appropriate moments – seemed to offend the fellow sitting next to me, perplexed by this fool sitting next to him who is not entertained. His enthusiasm for the proceedings did indeed bring a smile to my curmudgeonly ways, though my restraint won out in the end. The noise built steadily as the show began, some dignitaries made their way to the field, handshakes and pats on the back were exchanged, some fellows walked out with crested shields, a bit odd, but who am I to criticize someone else’s thing. There was some talk of the concerning infrastructure of the ancient edifice, but all that concerned me were the anachronistic - circa 1976 - speaker assemblies that hung perilously from the ringed roof of the place. These ominous signs of a forgotten age crackled endearingly to life, as a shrill and powerful round of anthems burst from the well-bearded deliverer of such things. The antiquated pendulums sounded as though they may burst, but fortuitously they survived and the match began. It was a knowledgeable crowd; hockey is not all that different from this type of football after all, and to my understanding, as with most of Canada, there is a long, unheralded tradition of the game in La Belle Ville. They did however fall victim to the much-feared and seldom noticed offside flag, which cut short their flared celebratory rapture when Braun was thought to have grabbed the club’s first. I will not bother to recount too much of the minutia of the match; if you are reading this you either watched the game, or have somehow landed at the wrong website, though if that is the case I doubt you would have read this far. 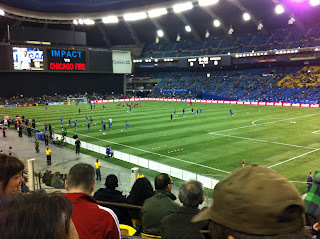 I was surprised by how tentative Chicago was, being a quick-thrusting attacking team, but I suppose it being their first match of the season, and one in the midst of such an unusual setting could have made those fast legs heavy with the weight of occasion. 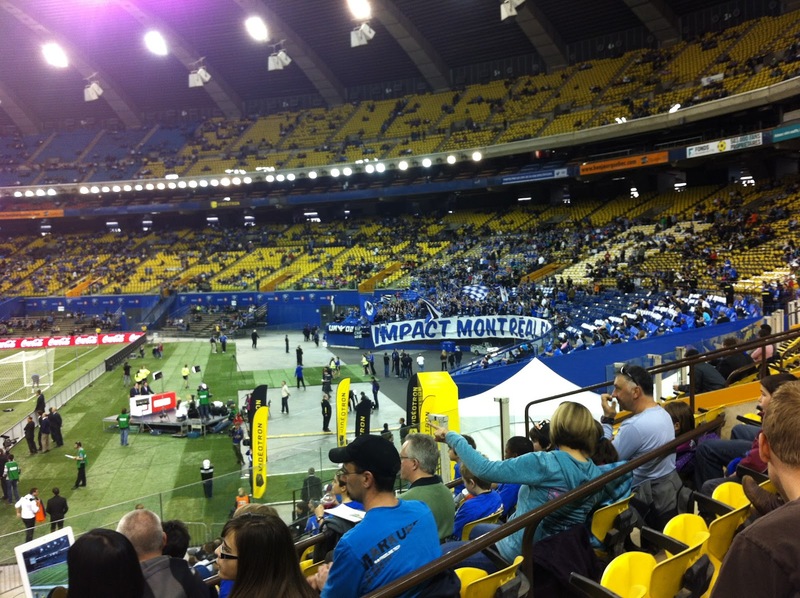 The first half played out sportingly – more or less – after a few early wobbles Montreal came into its own. 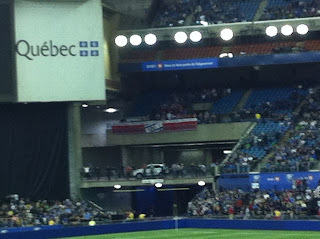 When Arnaud scored in the second, were noise a currency, it could have paid for the white elephant several times over – well, maybe just once, but it was an expensive stadium. Shortly thereafter, the aforementioned wave surfed around the bowl; I have a hard time being too critical of the dreaded expression of fandom. This was a large group of disparate people, gathered to enjoy the match, and when a small group of the less-educated – or more-intoxicated – provokes the grand gesture of stadiums, most are powerless to reject its appeal. There is a togetherness that comes from doing the wave, something seldom felt in the big cities of the world. If it makes them happy, and keeps them coming back, I was glad to have suffered through the ignominy to have been in its presence. Of course, Chicago would reply, Oduro, remembering what a good year 2011 was, decided to get an early start on a refrain. But then the crowd wanted it over. Montreal poured forward and but for the cruelness of the crossbar they would have had their blood when Gardner unleashed an unstoppable blast in the dying few minutes of play. Much like Toronto’s 2-2 draw with Los Angeles ten days prior, my primary concern was that the masses went home thrilled with the experience, to carry that goodwill with them for the sport I have chosen. But it was not to be – as it had been in Toronto – a draw was the outcome, but what a memorable one it had been. 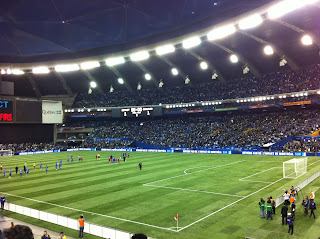 Montreal has impressed me over their two matches. I had expected them to struggle, granted it is early in a long season, but so far they’ve been resilient. Goals will be difficult to come by, but if they can keep things solid at the back and the Corradi signing works out it could be a decent season. It’s always difficult to predict how new clubs and - by extension - new players will perform in MLS. Some take to it and some will reject it. Corradi strikes me as someone who will enjoy his time here. He looked hungry when he came on. He looked to get involved in the action, was able to handle himself on the physical side and made intelligent runs, always looking for the ball. Wenger on the other hand, may not be as ready for the league as some believed. He looked lost out there, making the wrong runs, and getting berated by disappointed teammates. He has the right attitude though, something that can go a long way, but if the Impact are expecting serious contributions from him this season, they will be disappointed. I waited around post-match; taking in the scene as the crowds slowly began to thin. I was in no particular rush; my bus would not be leaving for another five hours and my station of departure – I discovered – was a mere minutes away by metro – I could have saved my cab money; lesson learned. Grabbing a surly coffee from a barista unimpressed with my linguistic failings, I retreated to a nearby park to refuel and read a bit of Philippe Auclair’s Cantona until the sun began to set and forced me indoors. Rather than sit around the bus station, I found a small pub in the area, Le Cheval Blanc on Rue Ontario, welcoming enough, where I enjoyed a pint of the Blanche in the bustling but cozy confines as I continued my reading. Soon the time had come to brace for the return leg of the journey; deprived of the scenery – it’s a dark ride – this one felt much longer. The free WIFI, though appreciated, could not provide a reliable stream of the night’s MLS action on my phone, so I listened without video to the TFC match in Seattle on a radio broadcast stream, for which I was thankful. Somewhat fittingly on this soccer odyssey, the bus trekked through Scarborough, one of many bastions of the Canadian game, before depositing me back downtown in a drunken city, reeking of green dye and spring-time rot. I made my way home slowly through the hoards of revelers, finally breaking the plane of my home at 4:30 or so in the morning. 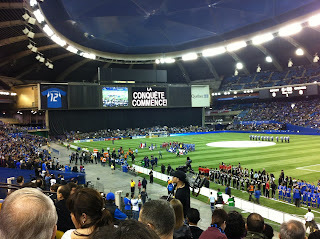 Nearly a perfect twenty-four hours spent in search of a Canadian soccer experience, one well rewarded, despite any trivial hardships. A sojourn well made; but one day does not quench that thirst. This was just an appetizer after all, a warm-up to the real dish. On April 7th, I and a few hundred, more likely thousands, of Toronto FC fans will make a similar journey back to the Big O, in search of more football. But this will be a very different experience to the pleasant, anonymous pilgrimage I had made. This one will be for pride, bragging rights, and a leg up in what should prove to be an almighty battle. The two clubs will meet five times this season after all. For when Toronto visits, the supporters sections will almost face each other, not quite head on, but will at least be within direct view of one another. The small legion of Chicago fans tucked up, virtually unnoticeably, beneath an overhang in a less-populated sector of the curve, will be dwarfed by another group clad in Red. I believe it will be a first for a Canadian crowd to have two sets of opposing supporters, of vast number, doing their best to out-sing each other. It will be something to watch. Without being too grandiose about it, it could be a quasi-Manchester United-Liverpool style of hatred that is on show that day. Please nobody mention Barilko, or the Richard riots. It’s obviously premature to make such a pronouncement, but the two cities go way back, and share a similar socio-politico-pecuniary rivalry to the grand old derby of the North-West of England. But enough of that idle speculation, we’ll see what the day brings in early April. For now, we can rest satiated with the fact that within the span of ten days I was able to attend two matches, in Canada, with an attendance above 45 000 and if you add those two matches to the sold-out home and season opener in Vancouver, approximately - or exactly, depending on your view of attendance figures – 127 570 people were there to watch three of Canada’s professional clubs in action within a fortnight. Now if only we could get those people out for the national team; that day is coming; we must be patient and enjoy the journeys and its milestones as they come.